Headley had been a “brick” (heroine) dealer in Chicago, but moved into undercover,DEA double-agent work. (Headley was born with a Pakistani name (Daood Sayed Gilani in Washington DC in 1960). Eventually, he would be recruited by illegal offshoots of Pakistani intelligence associated with Al Qaeda to case out the Mumbai (Bombay) bombings in November 2008, the deadliest incident since 9/11. His mother would operate a bar in Philadelphia called the Khyber Pass (named after a famous border area between India and Pakistan). There is a further story by Ginger Thompson from the New York Times in the Deccan Herald here. Later Headley would “operate” in Copenhagen and try to plan further attacks regarding the Jyllands Posten Muhammad Cartoons Controversy, but these additional incidents were called off. Rotella found that people who had known Headley did not want to talk about him, as if they could be made to appear responsible for the attacks. Last night, an episode of “Terra Nova” on Fox (TV blog, Sept. 26, 2011) featured a meteor hit with an EMP effect on the “colony”, knocking out most chips and electronics in the compound. The episode was titled “Nightfall”. I wasn’t aware that a meteor could affect electronics with its blast. Of course, a meteor might contain a lot of magnetizable iron. According to a wiki networkdictionary article, this effect is actually possible, (website url) link. In the episode, a middle-aged “techie” was able to repair one chip, and regenerate all the other chips used by the compound. This sounds very unlikely. The concern might seem timely since an asteroid will pass by earth today at about 6:30 PM EDT, at a distance of about 200,000 miles. No one has suggested that there is any danger to electronics. An alien or extraterrestrial attack really could start with a high-altitude EMP blast, however. Fox’s link for the episode (requires subscription) is here. Here’s a YouTube video (4 min) made by Scott Pendleton and fiancé Jen Fox on Feb. 14, 2005, when I videotaped a meteor crash, were “attacked” and disappeared (or “went up”). A pretty good horror short. Apparently this occurred near Tacoma, WA. The title of the film is “Case Tape 347”, posted by Paxton10, who says that the couple is still "missing". Is the couple pulling our leg? It's pretty effective low-budget horror filmmaking; ought to enter it into a short film contest. Picture: Autumn light; note the UFO in the picture. On Sunday, Nov. 6, the National Geographic Channel aired Peter Bergen’s riveting documentary “The Last Days of Osama bin Laden,” one hour, at 9 PM EDT. Mr. Bergen, well known as the media’s leading terrorism analyst in the days after 9/11 (and author of “Holy War, Inc: Inside the Secret World of Osama bin Laden”, Free Press, 2002), starts the film by visiting bin Laden’s neighbors in Abbottobad. Then, the film reconstructs the raid in more detail than ever before, including all the meetings in the Obama administration leading up to it (starting in December 2010, about the time of the final debates on repealing “don’t ask don’t tell”), and showing members of the administration watching the raid inside the White House the afternoon of May 1, in a small room in the White House, which had been closed suddenly to visitors for the day (a tip-off that something was happening). Osama bin Laden died in relative poverty. His compound had been set up to be relatively “self-sufficient”, and even had a miniature farm to raise its own food. However, captured notes after bin Laden’s death still showed very dangerous plans against the US homeland. The Administration was no more than 65% sure, on circumstantial evidence, that bin Laden had been living in the compound. Nevertheless, on Friday April 29, Obama made the same decision Eisenhower had once made about D-Day. The CIA had set up a training base in coastal North Carolina, not far from Fort Bragg, where the Navy Seals team rehearsed the raid. The film documents more clearly than most, how the CIA, NSA, and military branches (and their personnel) must work together. Gen. Petraeus was in charge of the raid, and coordinated it from NATO headquarters in Kabul. The CIA had, however, set up operatives (local people, or individuals who blend in with the locals) to gain intelligence as to how people had lived in the compound. Generally, this is how the CIA “hire” ground “agents” for anything; they are “ordinary people” (the issue was also covered in another natGeo film aired tonight, below). The NSA had satellite intelligence on the compound and had even measured the length of bin Laden’s shadow, rather like estimating a distant person’s height by trigonometric triangulation. See TV blog today for related films “Bomb Hunters: Afghanistan” and “CIA Confidential: Pakistan Undercover”. 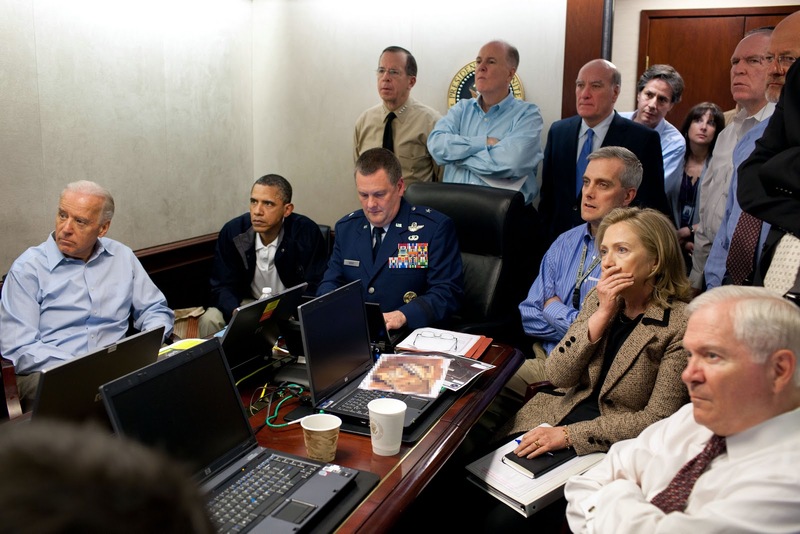 Wikipedia attribution link for picture of White House Situation Room.